JONESBORO, Ark. 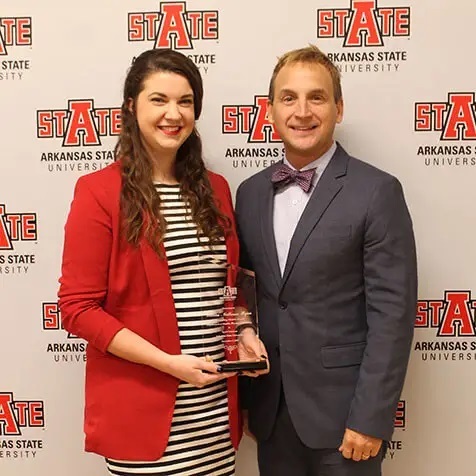 — Hytrol Health Club Coordinator Lauren Matheson Ryan received the 2018 Outstanding Alumni Award from the Arkansas State University Department of Health, Physical Education and Sport Sciences during A-State’s homecoming activities on Nov. 2. The award is presented to individuals who demonstrate professional achievement, community service, and continued involvement with the A-State HPESS department. Ryan supervises an internship program at Dan’s Health Club for the university’s health promotion and exercise science degree programs and as a community rotation site for the nutritional science program in the College of Nursing and Health Professions. She earned her bachelor’s in health promotion and master’s in exercise science from A-State and serves on the HPESS Bachelor of Science in Health Promotion Program Advisory Committee. Ryan joined Hytrol in 2014 and is responsible for Hytrol’s health club including staff, equipment and classes. She resides in Jonesboro with her husband, Kevin.